Sedale McCall weaves narratives with numbers. As a digital analyst at Glover Park Group (GPG), he examines how people connect online so he can empower clients to empower audiences. “Numbers tell a story. They say something about what’s happening, what’s happened, and what’s going to happen,” says McCall, SOC/MA ’16. He analyzes sets of data to learn how people discuss a given issue, whether certain events spawn a greater volume of conversation, and whether people talk about an event positively, negatively, or neutrally. It’s like opening a new puzzle every day. When the data is compiled effectively, you see a clear picture and can illuminate trends you might not have otherwise seen. But if all you saw was a jumble of numbers, the story behind them would be indecipherable. McCall puts together these narratives so his clients can solve problems, whether that’s changing perceptions or getting people to rally around a particular cause. “We’re trying to give people the information they need to be effective. We help them understand where there are gaps in knowledge, and we create messaging they use to help people,” he says. Take the NFL, for example. GPG helps the organization promote certain initiatives, like Play Smart. Play Safe. which advocates for player health and safety. McCall’s job is to research how social media users discuss and perceive the organization–and the sport at large–to influence how the NFL’s initiatives are presented, promoted, and shared. Before working at GPG, a communications consulting firm located in Washington, DC, McCall worked in advertising and public relations. He noticed that his managers not only delivered great content, but they also had a particular vocabulary that allowed them to sell it effectively. McCall had the strategy but wanted those communication skills. 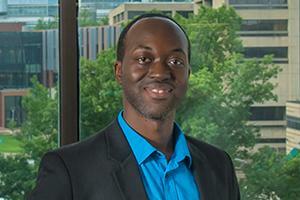 That’s what drew him to AU’s strategic communication master’s program–he wanted to learn the language of marketing. McCall was drawn to AU because of the prestigious department and the opportunity to learn from leaders in the field. He was impressed by the connections his professors had to their crafts. As practitioners in their respective fields, they provided not just the knowledge, but the application of that knowledge, which McCall says was different than other communication programs. He credits Joseph Graf, who taught communications theory, and Paula Weissman, who taught communications research, for instilling their classes with personal passion and insider information. Through the strategic communication program, McCall gained confidence as a strategist and that confidence propelled him to take on new roles at his company, earning him a 60% increase in salary. And now he is back at SOC, as an adjunct instructor teaching adjunct instructor teaching Social Media Strategies and Tactics. Uncovering connections is integral to communicating change. That’s why McCall loves social media. When it comes to communication, very little happens within one person, he says. The beliefs and decisions you make often come from an environmental source. Ultimately, McCall wants to use his skills to make a positive impact. He admires AU for inspiring a passion for public service in its students. That’s why he likes the digital realm, which is democratizing more than just the public conversation. It’s also allowing companies with fewer resources to advocate for good causes in a more accessible space. Learn more about our graduate program in Strategic Communication, and request information.